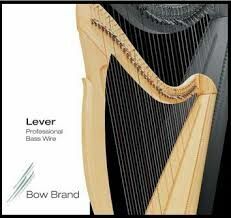 Bow Professional Lever Bass Wires (1.00mm to 1.80mm) for harps including Salvi and Lyon & Healy. Slightly lighter gauge and lighter tension than the standard Bow Lever Wires (1.24mm to 1.97mm). The prices listed for Full Sets of 8, 10 or 12 strings include a 10% discount.